The information provided in this review is not the result of personal testing performed by our staff and should not be considered as such. Karmagenes is a Swiss startup centered on the idea of examining portions of your DNA to isolate potential genetic prerequisites for certain behavioral patterns. It claims that every type of behavior stems from a genetic root, which is further molded by environmental factors like home life and stressors. The #1 man behind Karmagenes, Kyriakos Kokkoris, argues that you can always cheat a theoretical personality test but never your DNA. Speaking of people behind the company, they constitute an interdisciplinary team ranging from doctors in molecular biology, genetics, psychology, and neuroscience to engineers in communications, data security, and network coding. The entire team is devoted to communicating science effectively and delivering excellent products to users. 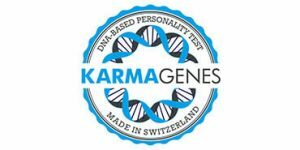 Keep reading our in-depth Karmagenes review to determine if this is the right DNA testing provider for you. Placing an order – Once you decide on a specific Karmagenes DNA test, you can simply place an order through its website. The company will then send you a DNA testing kit, which should arrive at your address within 3-5 business days. Sample collection – The kit uses cheek swabs to collect and secure your DNA sample. The procedure is entirely painless and takes around 2 minutes to complete. Sending the sample back – Once you have your DNA sample, you can send it back to the Karmagenes lab for processing. It’ll take between 3 and 5 business days for the company to receive your DNA. Note that the return mailing costs are not covered by Karmagenes. DNA processing and notification – The sequencing of your sample will begin within 8-12 business days upon arrival. You’ll receive a notification as soon as it’s initiated. Registration and questionnaire filling – You will be prompted to fill out a short psychological assessment once your DNA sequences are ready (2-3 business days). Karmagenes report – “Meeting yourself” is the final step of the process. Within 3-5 business days, you’ll receive the final 20+ pages report so that you can finally discover your “Nature and Nurture” and unlock your full genetic potential. Note that you should avoid eating, drinking, smoking, brushing your teeth or chewing a bubble gum at least half an hour before collecting your DNA sample. This prevents the possible contamination of the sample, which can lead to an unsuccessful test. 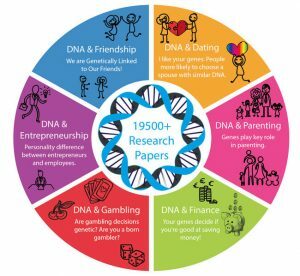 Karmagenes combines genetics with psychology and tries to help its users find out more about their inherent behavioral traits by learning more about their DNA. Before dealing with the actual tests, we need to take a closer look at the scientific methods and theories upon which the Karmagenes service is based. Namely, the company claims that SNPs (Single Nucleotide Polymorphisms) have a solid link with transmitters and chromosomes. It has based its business idea around the postulate that specific genetic variations lead to changes in our proteins, inducing hormone level changes, followed by neurotransmitter modifications, and resulting in behavioral change. This paints a picture of a neat domino-effect, but just how accurate is this theorem? Karmagenes links every behavioral trait with at least 4 SNPs and 2 genes, alongside other relevant factors. In our opinion, our behavioral traits hinge on so many factors that we couldn’t even list one-third of them. The company basically claims that complex behaviors like risk-taking and decisiveness can be translated from solitary variations in our DNA, which we find to be beyond unlikely. DNA variations do contribute to predispositions for certain traits, but we would argue that environmental factors have a much bigger role in molding and shaping our genetic potential for actual phenotypes. Having said all this, it’s time to focus on the next section of this Karmagenes review and explore the company’s tests. Quick assessment: Only psychometric analysis (29.95 CHF; approx. 30.32$) – This test is simply a self-assessment questionnaire delivered to you via email. Once your answers are analyzed, your results will be delivered to your home address. Karmagenes covers all shipping costs. The company doesn’t state the usual turnaround time, though. The questionnaire analyzes 13 personality traits, including social, confident, decisive, spontaneous, bon vivant, calm, driven, emotional, stress tolerant, self-aware, optimist, and risk-taker. The official website states that the test analyzes 14 modern behavioral traits, but stress tolerant is listed twice, so that leaves us with 13. 45′ introductory online session (95.00 CHF; approx. 96.17$) – This option allows you to engage in a one-on-one consultation session with one of the company’s expert advisors. You can pick the advisor you want and you have 45 minutes with them to evaluate your behavioral strengths and weaknesses. The online session includes a KG5+ questionnaire, which is a psychometry-only test. 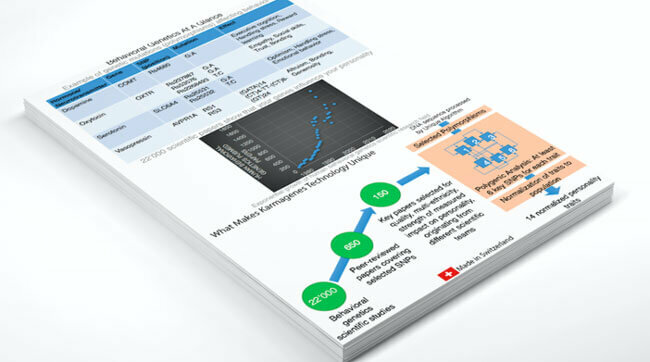 Full understanding: Your analytical genetic and psychometric report (199.00 CHF; approx. 201.45$) – This option includes a saliva-based DNA test, KG5+ online questionnaire, full analysis of 13 personality traits, and later consultations. Go to the next level: Complete behavioral analysis + 4 online sessions (484.00 CHF; approx. 489.97$) – The “Next Level” test includes a saliva-based DNA-test, KG5+ online questionnaire, analysis of 13 behavioral traits, all-around behavioral analysis, four one-on-one online consultations (45 minutes) with an advisor of your choice, and long-term goals and objectives. We’ll be completely honest about Karmagenes. In our opinion, the idea that you can reduce such a complex phenomenon like human behavioral patterns to analyzing specific SNPs and conducting a psychological test is plain wrong. Your report will, for the most part, state that your personality features are influenced by your DNA on a medium level and it’ll use the answers from the psychological test to “form” your personal profile. Furthermore, the specific trait descriptions are too vague and tips for improvement too general. As far as the genetic component of the test is concerned, we haven’t seen anything specific of interest. The results don’t give information about the SNPs tested and how the final results correlate with certain personality traits. On the other hand, the report is ripe with endless indefinite descriptions of the potential genetic influence on our behavioral patterns. Karmagenes states that it has chosen not to reveal its analysis methods due to the inability to legally protect its “secret formula” on a global scale, so we guess we’ll have to wait until the company deems it safe to publish its testing protocol. The results do not offer any type of health-related insights. Also, Karmagenes doesn’t allow you to download your raw data. This information is collected when you place your order, register on the site, respond to surveys, subscribe to the newsletter, and fill out forms. Reputable gateway provider for financial transactions. To respond to inquiries and provide adequate user support. The collected information is usually stored for 1 year, after which it’s deleted or aggregated unless deemed necessary to retain it. The company will never share your information with third parties unless responding to a legal request (court order, search warrant or subpoena). We already listed the usual delivery times for Karmagenes DNA test kits in the previous sections of our review, also stressing the fact that the return shipping costs are not prepaid. The company does ship internationally but cautions users to check the regulations in their country regarding genetic testing. Most countries shouldn’t have a problem with direct-to-customer non-health DNA testing, though. Karmagenes is a company that, unfortunately, proves that unique and new is not the same as good and useful. Don’t get us wrong, there’s nothing inherently bad about the service, except the fact that it’s based on a pseudo-scientific foundation. The results offer a multitude of feel-good inspirational quotes rather than actual science. You’re given half-baked behavioral analysis based more on psychology than your DNA signature. Therefore, we just can’t see the actual value we’re getting for the money invested. The main test costs almost 500$, which is way above the price range of an average trait DNA test. To conclude this Karmagenes review, we can recommend this company’s tests only as a fun experiment. For people interested in hard science, this is definitely not the right DNA testing solution. Our ratings are the result of an objective and independent evaluation of Karmagenes, generating the final rating that reflects the overall quality of the company. Ratings may change as the service changes. We found 0 verified Karmagenes discounts for April, 2019.